Pressure Changes | Tennessee Aircraft Services, Inc.
As a typical aircraft owner, your thoughts of maintenance likely center on aircraft safety and cost. If you received a letter from Cessna saying they made a change to the maintenance manual, you might be tempted to ignore it. After all, that’s just stuff your mechanic needs to know. In case you missed it, Cessna has sent just such a letter to owners of all restart (all built since 1996) 172, 182 and 206 model planes. Make no mistake, if you don’t get an understanding of its contents, you’ll be flying an unairworthy Cessna. Even if you’ve just been skimming through all the various articles in this magazine over the last few years, you already know that factory “required” maintenance items are not truly mandatory. The only entity that can declare any item as mandatory is the FAA. Cessna’s change to their maintenance manual chapter 4 is a little nebulous in its presentation. It looks like a Cessna requirement, but on airplanes certified under FAR Part 23 (or partially as the 172/182/206 are); chapter 4 of the maintenance manual is an FAA certified chapter for airworthiness limitations and must be complied with. In January 2007, Cessna issued service bulletin SB07-79-01 mandating (Cessna required, not FAA) replacement of the oil pressure switch on most all the restart piston singles produced to that point. This applied to pressure switch p/n 83278 which Cessna said should be replaced at 3000 hours. It also required visual inspection every 50 flight hours. It is interesting the bulletin listed a limited serial number group even though the same part was still being installed on new production airplanes. One would expect the limited serial number run implies an improved part was being used in the newer production aircraft to terminate the repetitive action. The current replacement oil pressure switch is still p/n 83278 and will have to be replaced when it reaches 3000 hours as well. 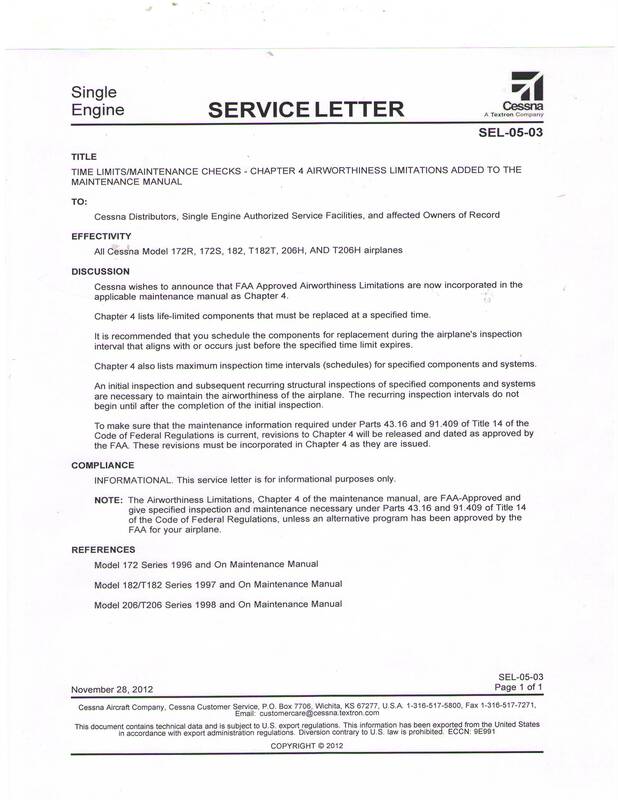 At the end of November 2012, Cessna issued service letter SEL-05-03 to inform interested parties that a time limit for the oil pressure switch has been added to chapter 4 of the maintenance manuals for the restart 172/182/206 series. This service letter was mailed to owners as part of an owner advisory on the subject. The service letter has all the proper wording to explain that this new time limit item is actually FAA required. 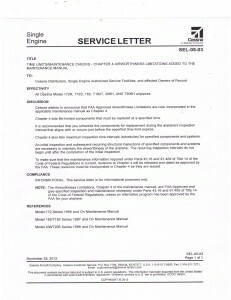 However, due to owners’ unfamiliarity with the implications of Airworthiness Limitations in the maintenance manual, there may be a predisposition to ignore this letter as applying only to mechanics. In the Compliance paragraph of the letter, it states that “this service letter is for informational purposes only.” Just after that is a note which explains the regulatory basis for compliance. The term “informational” also might lead an owner to toss this letter to the round file without grasping the proper level of urgency. It is true that the letter itself isn’t making any maintenance requirement and has no instructions for work to be done. It is purely informational in that it points one to the document which does have all the technical and legal requirements. My concern is that the letter assumes the reader has some idea what the implications of all the referred regulations mean. Until the restart of production, none of these planes had a section of the maintenance manual that was FAA approved. There are plenty of mechanics out there that haven’t been exposed to FAR Part 23 airworthiness limitation sections and haven’t considered that these planes have any. It should not be a problem at Cessna authorized service stations, but independent mechanics are an unknown. As always, the airworthiness compliance responsibility buck stops at the owner/ operator. Unlike some airworthiness directives and other FAA required scheduled maintenance events; this airworthiness limitation has no grace period. It also doesn’t allow the operator to wait until the plane goes in for its next annual inspection. It clearly calls for 3000 flight hours. Since the operator (you) are the one that keeps up with how much time the plane flies, the responsibility to ensure this part is changed at the appropriate time generally falls to you. If the plane goes into the shop for an annual inspection or after the 3K mark, then the inspector is responsible to deal with this as a part of ensuring the airplane meets all the requirements for airworthiness. If he/she isn’t using a current Cessna maintenance manual, it will likely be missed. As a well-informed owner, you can make sure the mechanic is aware of the requirement and gets this done. If the plane has already exceeded the 3000 hour mark, then it is unairworthy where it sits. Your options are somewhat limited in this situation. You might hire a mechanic to travel to the plane and perform the simple part replacement, make the appropriate maintenance record entry, and all is good. If you don’t have a mechanic that makes house calls, you could obtain an FAA Special Flight Permit to relocate the plane to a place where the work can be done. Cessna has done its job to inform owners of this change as best they can. If everyone reads the letter and the documents referred to, which include FAR 43.16 and FAR 91.409, it should be clear that this maintenance item is FAA required. Unfortunately, I suspect many owners won’t understand the urgency of the message as written. I don’t know that this oil pressure switch has any history of failures. We’ve not seen any failures on the affected planes that we maintain in our shop. I suspect the worst case failure mode is an oil leak from the switch. Given its installation point on the engine, a catastrophic failure of the switch could allow the engine oil system to vacate its supply in short order. While in flight, I’d make the assumption that any oil pressure failure indication is real and make my way towards an airport immediately. At press time, Cessna has 120 of these switches in stock at a list price of $61.20 each. In the aviation world, that’s pretty inexpensive for a once in 3000 hour purchase. Switch replacement labor is minimal and one will spend almost as much time getting the top cowling off and on as it takes to mount the new switch. There are some politics involved in this mandatory parts replacement requirement process that are new to me. With the legacy airplanes, a problem part could only be life limited by issuance of an FAA Airworthiness Directive. Aircraft certified under FAR Part 23 have the airworthiness limitations chapter in the maintenance manual set at the time of aircraft certification and manufacture. Part of what makes this change interesting is that these three planes are more often considered as legacy CAR 3 certified instead of FAR Part 23 certified. Using an addition to the maintenance manual to publish an FAA required part change is not an expected move for most FAA Part 91 operations. It’s becoming more important for all of us to be diligent in all aspects to be sure our planes continue to fly safely and legally.